Is Blueshyft good for newsagents? Since the CEO of Blueshyft is a precious petal and sensitive to criticism and so there is no doubt, what I write here is my opinion, nothing more, nothing less. I have been asked by newsagents over the last few days about whether Blueshyft is worth considering. This has come about because of an email sent by XchangeIT promoting Blueshyft to newsagents. 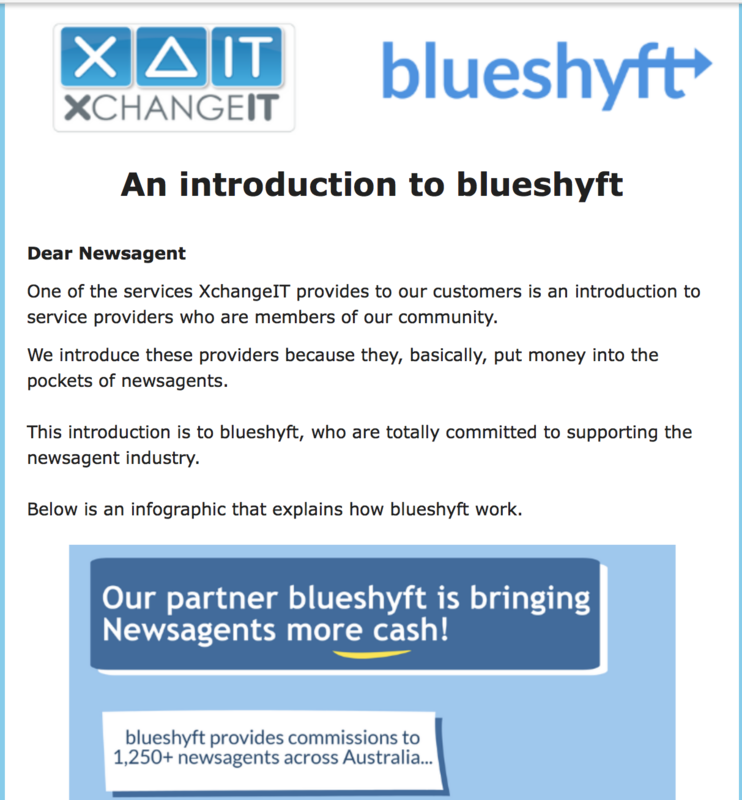 The email from XchangeIT sent to newsagents endorses and promotes Blueshyft. However, because it is from the magazine company controlled XchangeIT, some newsagents are understandably skeptical and asking about the pitch. Remember, XchangeIT costs newsagents money for a small margin product service that small business retailers in some other channels get for free. I have never been a fan of Blueshyft, because it is an agency offering that leeches off existing traffic and, occasionally, bringing in agent only traffic that rarely converts to reasonable GP business. As I have written many times previously, I see no future for agency lines in retail businesses. While our channel began as agents, we have moved beyond that – this started in 1999 with deregulation. 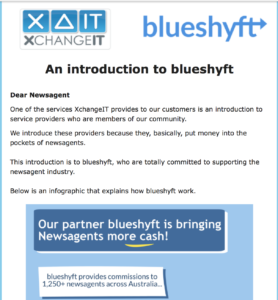 The XchangeIT email claims Blueshyft are totally committed to supporting the newsagent industry. I have not seen any evidence of this. Indeed, I think their technology approach, aided and abetted by XchangeIT, is the opposite. They bloat newsagency software stock files thanks to a less than ideal approach to tracking virtual inventory. Despite suggestions of more current tech approaches, there has been no interest in acting in the interests of newsagents in terms of data management from what I have seen. While the Blueshyft works, I think is distracts from the future of retail. Blueshyft is an agency service that primarily serves existing customers. While there may be some new traffic, basket analysis shows that rarely is that traffic valuable beyond agency. The question of whether Blueshyft is good for a newsagency business really depends on how you see your business: retailer or agency. A retailer will focus on attracting shoppers through different, good margin, product. They will do this to seek out new shoppers, to build long-term relationships. Their shop will be configured to provide an experience and a service level commensurate with the value of items sold and the time shoppers will engage with these items in-store. An agency business will be focussed on convenience, convenience of location and convenience of service. Speed will be key for shoppers and the business. Range of agency service will also be key. This type of business will usually identify more like a convenience store than a newsagency go today and the future. While some argue that foot traffic for agency business can be converted to retail sales, such claims are usually made by non retail business owners. If we look at newsagency basket data we can see agency lines such as lotteries, phone cards, phone recharge, betting account top up and newspaper sales as all predominantly not benefiting beyond the meagre commission paid. Is Blueshyft good for newsagents? It’s up to each newsagent to make their own decision. You need to decide what is right for your business today and into the future. I appreciate there are some in the channel who are happy being agents. I support their position even though it is not for me. Not for me, my focus is to exit all commissions business not add them. Their claims caught my eye though. – 1250 newsagents, so given how many are closing, they have 40% plus? – average income $255 pw so newsagents are getting $13k per annum, some over $30k? – Entirely free… with wages and premises already paid, the commission goes straight to the bottom line, no incremental costs such as credit card fees?